Now that 2018 is coming to a close, it is a good time to take a break from the monotony of daily operations and look around at the MRO industry: how far it has come, where it’s going, tech trends, and industry best practices. Let’s take a look at MRO products and services that will play an important role in 2019.Technology, particularly autonomous vehicle operation, is a major movement to substantially reduce the workload of highly skilled technicians of menial work, allowing them to focus on applying their skills to technical tasks rather than being pulled into tasks like monitoring aircraft towing operations. But the tech movement in aviation goes far beyond autonomous vehicles and robotics; it has to do with secure access to maintenance and engineering records (Blockchain), artificial intelligence and big data in predicting breakage before it occurs, and even 3D printing. Not all emerging technology in the aircraft maintenance world is directly related to maintenance tasks, although some certainly are. Aviation is dichotomy; in an activity where technological advances would be most appreciated, the industry often seems slow to adopt them at least in certain segments, most notably aerial navigation. This is largely due to regulation which has continued the use of radio-beam based platforms which represent decade’s old technology. However, MROs are showing strong interest in adopting technology not originally designed for this specific (or any specific) industry. Technically coined Unmanned Aerial Systems (UAS), these little multi-rotor flying eyes are proving viable in more industries than anyone could have predicted. Aircraft maintainers are seeing the light (or perhaps taking a page from the electrical power plant playbook) and are experimenting with the implementation of drones for aircraft visual inspections. While this is still limited to indoor use for the time being, this will explode as technology advances, prices drop, and regulations ease up a little on their usage around airports. But for now, using drones for visual inspection in indoor MRO stations and docks makes great sense. These aircraft are wonderfully stable and have excellent cameras which can get as close as the human eye can while saving images and videos of inspections for real-time reference, as well as future reference. As aircraft maintenance records continue to transition to cloud-based platforms, images and videos taken during inspections can reasonably be saved and kept in permanent file. This solution is an enormous boon for MROs, which represents an immediate reduction in man hours for visual inspections since a drone can cover every square foot of the fuselage, wings, and empennage immediately on activation and implementation. Visual inspection on large aircraft, particularly very large wide body jets, are either one of two things: painstakingly slow, or lacking in thoroughness. In order to conduct a thorough visual inspection over the entire body of the aircraft requires that technicians don harnesses and appropriate safety gear, and for large aircraft will require lifts or scaffolding. To avoid this, a topical visual inspection can be conducted from ground level, but that will leave huge blind spots on the inspection. The use of camera drones mitigates both of these. Technicians can inspect visually and get very close to the fuselage in the process, as well as documenting the visual inspection in the process. In the event that an area is identified for closer examination, technicians may then don harnesses and go directly to the area in question for further inspection. AI is the next big thing, perhaps the biggest thing of our age. Of course Hollywood has been playing with the concept for a very long time, but Skynet is hopefully just a theory. A collaborative study between industry juggernaut Boeing and Carnegie Mellon University created the Boeing/Carnegie Mellon Aerospace Data Analytics Lab in late 2015, with Boeing funding $7.5 million through the end of next year. The purpose of the lab is to sort through the mountains of raw data provided by modern aircraft to determine maintenance trends by airframe. Why is this significant? Raw data does not benefit the floor-level technician very much; it is absolutely overwhelming. Modern aircraft are really hubs of supercomputing hardware with wings and turbine engines attached; they all are equipped with powerful embedded computers which generate data every second they are operating. Data can be fed almost real-time into analysis processing revealing trends as the they occur, rather than determining information retroactively and modeling maintenance in that manner. Machine learning is a powerful tool in which all of the raw data which is largely going unutilized can be sifted to determine trends in operations, maintenance, and repair cycles. These are the nuance that does not necessarily show up as full-scale breakage but is instead very subtle indicators of fleet health. AI is the only solution which can begin to make usable metrics from the data produced by entire fleets of aircraft, yet those same mountains of information hold clues which could very well prolong the life cycle of the fleet or prevent a catastrophic incident in the future. Maintenance trends and analysis is not the sole application for machine learning and machine vision, i.e., big data analysis. In a market where minutes of ground time equate to millions of dollar over the course of the fleet per year, implementing machine learning and machine vision to streamline ground operations, taxi routes, and even approach and departure procedures can shave off valuable minutes for each leg of the operations, resulting in fuel savings and time savings. Commonly known as 3D printing, it was only a matter of time before additive manufacturing found its way into mainstream manufacturing. Still in its infancy, 3D printing is largely known for its recreational capabilities and applications. It has a purposeful side, though, as Boeing demonstrated in conjunction with the Oak Ridge by manufacturing a wing trim tool from ABS thermoplastic composites. This tool weighed over ¾ of a ton and was roughly the size of a pickup truck. So what’s the big deal? It’s a big chunk of plastic, right? Well, sort of, but it has implications much larger than this. This component would have once taken several weeks to set up tooling and die and then build, plus transportation. Additive manufacturing allowed it to be built from electronic files on location in less than two days. The long-term ramifications for this may very well change the face of replacement component manufacturing and repair. Popularized by being an integral component of cryptocurrency, Bitcoin in particular, Blockchain technology holds the keys to limitless potential in the financial component of MRO operations. In its simplest form, Block offers an incorruptible ledger which is updated constantly, and allows numerous parties to securely access and update information. Blockchain offers the ability to track and record life cycles of every single component on every single aircraft in a fleet, down to rivnuts and diodes. Blockchain allows ground floor technicians and end users the ability to research life cycles on every component digitally in a unique and secure location, eliminating the paper trail which propagates aircraft maintenance. What does this mean in real, tangible terms? It means that a technician who finds a defect in the compressor section of a turbine engine can proceed through the Blockchain ledger and trace the entire lifecycle of the faulty component. He then may add his own data which will allow all authorized parties to pinpoint mean times between failure, causing a net gain in safety and reliability. 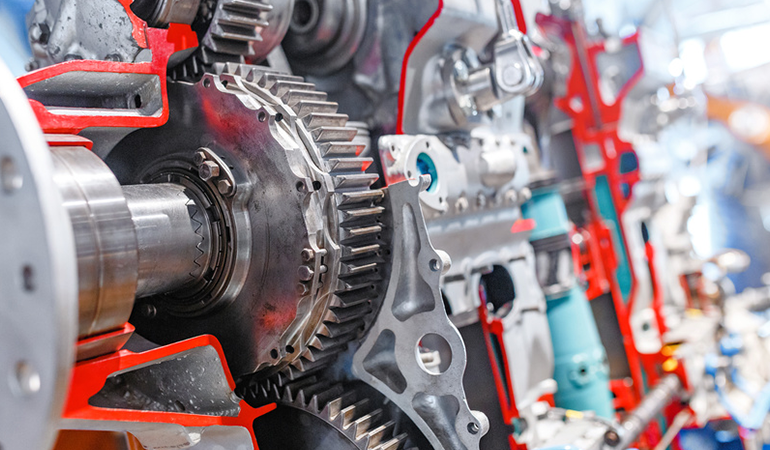 In the past, aircraft components have traditionally been replaced on an isochronal schedule regardless of any actual bearing of the components’ true lifecycle. Of course, the caveat is that there were often little more than engineering estimates in determining what a component lifecycle should have been to begin with. Prescriptive maintenance is the implementation of predictive analytics to determine what a life cycle is actually coming up and whether repairing the component or replacing the part is more advantageous to the aircraft. It moves away from the practice of replacing components part and parcel just because they reach a certain amount of hours or cycles. Training the technician workforce has traditionally required the availability of the applicable aircraft which is not always feasible. Training goes on hold when aircraft are unavailable, and technician performance deteriorates accordingly. Augmented reality offers the ability to conduct training accurately on an infinite number of different aircraft in an immersive environment. It can also be tailored to specific components such as engines, gearboxes, propellers, and anything else. In short, any part of the aircraft can be generated into an immersive environment for students to practice on without the necessity of an actual aircraft on location. The booms coming to MROs in 2019 are going to fit in your computer console. In fact, they will fit anywhere because they are all digital in nature. Data analytics, artificial intelligence, augmented reality, and Blockchain are all coming to a computer near you to optimize maintenance cycles and optimize life cycles. These are emerging technologies which were not intended for aviation; in fact, aviation probably had little if anything to do with the development of these technologies but they are fairly universal in applicability. They will streamline processes, and pay huge dividends in developing the ability to accurately predict life cycles for part replacement before failure rather than after. You want to keep up with the latest news and trends in aviation and ground handling? Subscribe to our blog for free and don’t miss out on future updates!